The base 2011 Hyundai Elantra doesn’t give up much; if you’ve only seen the Limited so far at the dealership, make sure you do a comparison with the significantly more affordable GLS. 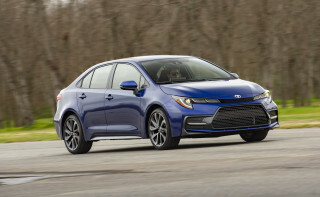 38 mpg; a sleek, sophisticated look; and even more value for the money confirm that this little sedan has officially left the Corolla in the dust. 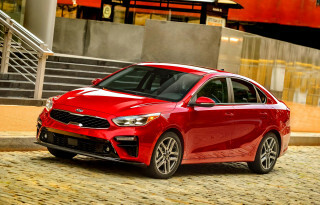 The compact-sedan class has hardly been an area of innovation in the auto industry, but Hyundai has pushed past rivals like the Toyota Corolla with a very stylish, well-detailed, and technologically advanced new version of its Elantra sedan. While holding the line on performance compared to previous versions, the Elantra achieves much-improved fuel economy—38 mpg highway over the entire model line, as well as improved passenger comfort and interior refinement. From the back you might mistake the Elantra for its large Sonata sibling; but with the Elantra an even smoother take. Hyundai intended to take the Elantra in a "sporty and modern" design direction this time, and we think it succeeded—this new compact sedan looks, from some side angles, like it's about to leap forward. The exterior builds on the automaker's Fluidic Scupture theme that applies to the mid-size Sonata, but in the Elantra it's a little more crisp and aggressive, a little more athletic. Inside, the Elantra combines traditional Hyundai swoopiness with some interesting new cues—specifically, the pinch point where the center console meets the rest of the dash, as well as the strongly hooded gauge cluster. Hyundai has downsized its engine in the Elantra for 2011, to 1.8 liters and thanks to an all-new engine design the automaker is able to significantly improve fuel economy (and reach a 40-mpg highway figure) while keeping performance on par or better than with the outgoing 2.0-liter. Performance is pretty respectable from this engine, provided you're not afraid of eliciting downshifts. And its 148 hp and 131 lb-ft is enough because the new Elantra weighs less than 2,700 pounds (and, actually, 62 pounds less than its predecessor). 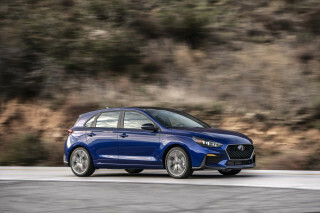 Still, there's nothing particularly athletic or inspiring about the Elantra; throttle response can feel dulled and delayed, and steering feel isn't close to on par with that of particularly crisp-handling small sedans like the Mazda3 or Suzuki Kizashi. Brakes are great, though; they're four-wheel discs, rather than the rear-drum setup that's pretty common in this class, with a nice, firm pedal feel. The 2011 Hyundai Elantra has an interior that's almost mid-size caliber—almost if it weren't for the tight headroom in back that's so often the mark of a compact cabin. Front seats could use a little more support, and while backseat space is a little bit better than what we're accustomed to in this size of vehicle, there's simply not enough headroom for taller adults. Seats fold forward easily—though not quite flat—but there's a wide trunk opening, and throughout the interior you'll find plenty of thoughtful cubbies and storage touched, plus a power plug and USB input. Ride quality is excellent; the Elantra soaks up road noise better than most small cars, and wind noise is well-muted at 70 mph—at the level you'd expect in a mid-size sedan. Hyundai has become known, in any of its vehicles, for sweetening the package with a few more features than you'll find standard elsewhere in that model's class. That's again the case with the 2011 Hyundai Elantra; even the base GLS comes with power windows, locks, power mirrors, keyless entry, and (on automatic models) air conditioning, cruise control, and telescopic steering adjustment. Hyundai boasts that the nav system has the largest screen size in this class. For the price, its beautiful. And it really is a great system, incorporating voice recognition for phone, audio, and nav control, plus XM NavTraffic, NavWeather, Sports and Stocks integration, Bluetooth audio streaming, 16GB of onboard flash memory, Satellite Radio capability, and the capability to play picture slideshows. The 2011 Hyundai Elantra positively grabs our attention and won’t let go—a feat in a class of otherwise boring small-car styling. From the back you might mistake the Elantra for its large Sonata sibling; but with the Elantra an even smoother take. Hyundai intended to take the Elantra in a "sporty and modern" design direction this time, and we think it succeeded—this new compact sedan looks, from some side angles, like it's about to leap forward. The exterior builds on the automaker's Fluidic Scupture theme that applies to the mid-size Sonata, but in the Elantra it's a little more crisp and aggressive, a little more athletic. Hyundai's design direction with these sedans makes them standouts, but the down side, to these eyes, is that it risks looking dated sooner than more conservative models. Inside, the Elantra combines traditional Hyundai swoopiness with some interesting new cues—specifically, the pinch point where the center console meets the rest of the dash. In person, the new interior impresses as a little odd at first, but the more we pored over the details, like the nice hooded gauge cluster and well coordinated two-tone themes, the better we liked it—and the more the entire design seemed to 'pop,' and make sense. 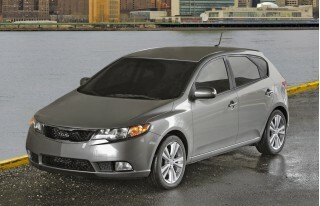 The 2011 Hyundai Elantra performs adequately and confidently, but doesn’t in any way feel athletic. Hyundai has downsized its engine in the Elantra for 2011, to 1.8 liters and thanks to an all-new engine design the automaker is able to significantly improve fuel economy (and reach a 38-mpg highway figure) while keeping performance on par or better than with the outgoing 2.0-liter. The new, all-aluminum 'Nu' engine, with a host of improvements and/or weight-saving measures like a composite intake, silent timing chain, and electronic throttle (but not direct injection), is now the only engine offered on the Elantra in the U.S. Its idle quality is glassy-smooth, and it never reaches that coarse, buzzy range that makes so many small fours unbearable in their peak powerband. Performance is pretty respectable from this engine, provided you're not afraid of eliciting downshifts. And its 148 hp and 131 lb-ft is enough because the new Elantra weighs less than 2,700 pounds (and, actually, 62 pounds less than its predecessor). This is an engine that's right at home in the 2,500 to 4,500 range—and one that does well with the six-speed automatic transmission, the way about 93 percent of Elantras will be sold, Hyundai estimates. That said, some of the same annoying Hyundai powertrain traits remain—namely ridiculously slow, delayed throttle response. You can literally floor the gas pedal for a pass, in a fraction of a second change your mind and lift back up, and the electronic throttle or ECU pretends it never happened. Steering feel is better than what's offered in the larger Sonata, but it's still not on par with that of particularly crisp-handling small sedans like the Mazda3 or Suzuki Kizashi. While the steering felt fine at lower speeds, it's too light on center at higher speeds, with a peculiar weighting (and that dreaded 'digital' feel) off center. Brakes are great, though; they're four-wheel discs, rather than the rear-drum setup that's pretty common in this class, with a nice, firm pedal feel. A smooth, quiet ride, plus very pleasant interior appointments, make the Elantra’s cabin a step up from most small-car accommodations. The 2011 Hyundai Elantra has an interior that's almost mid-size caliber—almost if it weren't for the tight headroom in back that's so often the mark of a compact cabin. Otherwise, the Elantra's interior is generously sized. This 6'-6" editor had no problem getting comfortable in the Elantra; though as is typical for this class, the lower cushions were on the short side. Front occupants get plenty of headroom with or without the sunroof, thankfully. The front seats of our test Limited and GLS cars looked like they would have some lateral support, but the slightly risen seat edges (a nod, at least in appearance, to lateral support) do nothing for sharp corners. The leather that's available is perforated in a wave pattern and won't be mistaken for luxury hide, but it feels supple enough. Backseat space is a little bit better than what we're accustomed to in this size of vehicle—in terms of legroom—but the shortage of headroom (just like the Cruze and Civic) keeps it from being a true mid-size offering. 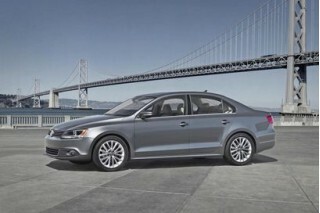 Only the Jetta has noticeably more headroom in back. While rear-seat heaters are on the options list—kudos for being first ever in this class—there are no true backseat heater vents (also like most vehicles in this class). Pop the trunk and up high there are two easy-release pulls to fold down the 60/40-split rear seatbacks. They don't quite fold flat, but there's enough of an opening to easily fit skis, or a lamp. There are a few very nice, thoughtful touches in the Elantra. Flip up the big center-console lid, and you'll find a power plug and USB input, so you can hide away your iPod or the like; but over on the passenger side, there's another side compartment and power plug for the passenger, or for another device. The 2011 Elantra has a very smooth, quiet ride, thanks to a suspension that isn't exactly tuned for high-performance situations. It soaks up road noise better than most small cars, and wind noise is well-muted at 70 mph—at the level you'd expect in a mid-size sedan. 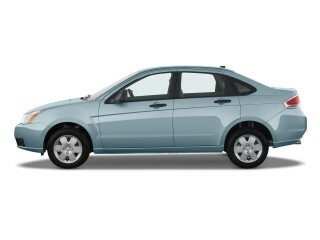 The 2011 Hyundai Elantra is shaping up to be a very good choice for the safety conscious small-car shopper. The 2011 Hyundai Elantra is an all-new model, completely different structurally than last year's model, and it hasn't yet been tested by either the Insurance Institute for Highway Safety (IIHS) or the National Highway Traffic Safety Administration (NHTSA). The Car Connection has high expectations for the 2011 Elantra, as other Hyundai products that have been recently redesigned—like the 2011 Hyundai Sonata—have earned excellent crash-test ratings. Among budget-priced compact cars, not all safety equipment is always standard (stability control, for instance is sometimes optional in this class). But it's all here and standard across the model line: stability control; anti-lock brakes with Brake Assist; a new Steering Effort Assist system that helps steer you back toward stability and control in a skid; front seat-mounted side airbags; and front and rear side-curtain bags. Outward visibility is quite good in the Elantra, even considering the swoopy shape, though there is a rearview camera system available. 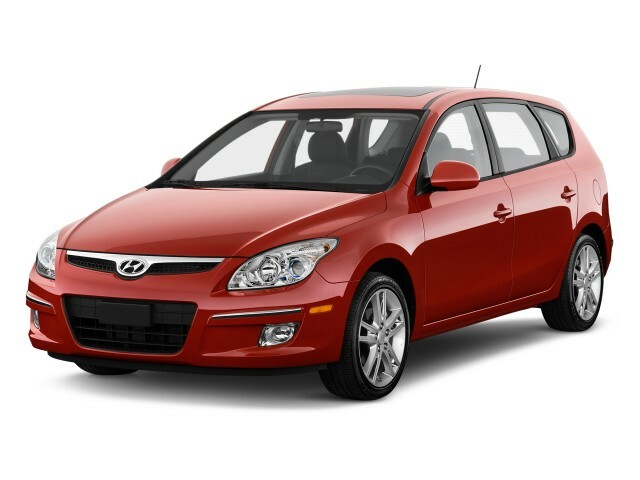 With a long standard-feature list, and some excellent tech and connectivity options at the top of the line, the 2011 Hyundai Elantra offers more for less. Hyundai has become known, in any of its vehicles, for sweetening the package with a few more features than you'll find standard elsewhere in that model's class. That's again the case with the 2011 Hyundai Elantra; even the base GLS comes with power windows, locks, power mirrors, keyless entry, and (on automatic models) air conditioning, cruise control, and telescopic steering adjustment. Oddly, Hyundai makes the telescopic adjustment optional on manual-transmission cars, available as part of a Popular Equipment Package. The Limited model adds a sunroof, leather seats and trim, heated front and rear seats, fog lamps, mirror-mounted turn signals, and 17-inch alloy wheels with Continental tires. Top options on the Elantra Limited, all part of a Premium Package, bring the nav system, premium audio, and proximity key entry and push-button start. Even on the GLS, you can get a Navigation Package. To help make the whole ordeal of supply and demand a little easier for all involved, the new Elantra is being offered in just seven build combinations. The down side of this strategy is that there are still holes; you can't, for instance, get the navigation system if you want a manual transmission. The 2011 Hyundai Elantra Limited Premium that we spent the most time with cost $22,700, while the base 2011 Elantra GLS starts at $15,550 (both prices including destination). 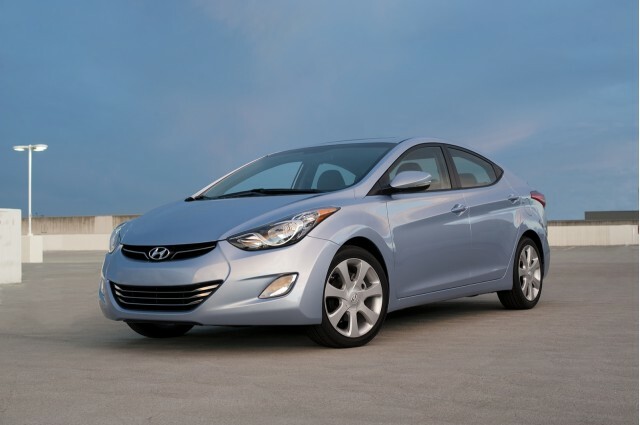 All trims of the 2011 Hyundai Elantra come with a 38-mpg highway rating. The 2011 Hyundai Elantra comes with official EPA fuel economy ratings of 28 mpg city, 38 highway across the entire model line. Several other models on the market, such as the Chevrolet Cruze and Ford Fiesta, achieve 40 mpg or better, but only in one specific trim. Most, like the Elantra, sit in the 38-mpg range. Considering that most of a vehicles lifetime carbon footprint is related to fuel use, that makes the Elantra a very green car. In an aggressive drive route that took an editor up into mountains, skirting 5,000 feet elevation at times, a test Elantra registered 26 mpg; then driven on a mostly level stretch of Interstate at 65-70 mph we managed to average 39 mpg—so at first test the Elantra's figure looks easily attained with the cruise control on a relatively level highway. NOTE: The 2011-2013 Elantra lineup was found to have overstated fuel-economy numbers. Hyundai initially claimed up to 40 mpg highway for some models, but after a consumer campaign alleged lower real-world economy, the EPA ran a confirmation check of the Elantra lineup and of several other Hyundai and Kia vehicles. 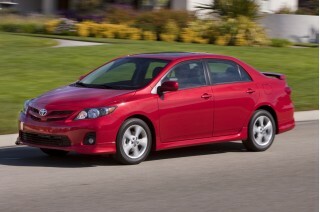 The tests resulted in restated fuel economy numbers for all involved model years. Owners can register with Hyundai to receive reimbursement for the gas consumed above and beyond expected levels; more details are found at HyundaiMPGInfo.com.